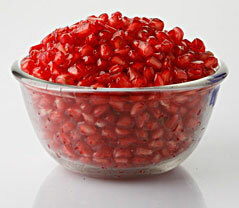 Pomegranate Juice is extracted from sound, ripened and washed fruits, which are depadded by a mechanical process. Thorough screening & separation techniques are used to make the juice free from particles and impurities. Subsequent processing involves commercial pasteurization which ensures food safety & composition as per international standards. Pre-cooled juice in drums / pouches allows freezing at -18°C in a Blast freezer. Strictly hygienic conditions are maintained at every step along the processing line.